For the second straight game, the Bobcats faced adversity in the closing minutes of the game. For the second straight game, the Bobcats came out as the victors. Despite a sluggish game from both sides, Ohio (3-1) defeated Morgan State (0-4) 65-62, thanks to a last second lay-up and free throw by junior guard Stevie Taylor. And ugly it was. Both teams shot poorly from the field, with Ohio shooting 42.9 % from the field and Morgan State shooting 37.3 % from the field. To add to the bad play, both teams shot a combined 55.7% from the free throw line. Despite the poor shooting, the Bobcats made big plays down the stretch. Down one with 3:37 remaining in the game, junior forward Maurice Ndour hit a three to give the Bobcats a two point lead. After the Bears tied it on two free throws by center Ian Chiles, Ndour hit what appeared to be another three, but was ruled a two-pointer by the officials. It still gave the Bobcats a 62-60 lead with two minutes remaining in the game. With under a minute left in the game, Morgan State guard was fouled on a rebound by Ndour, which was his fifth foul of the game. With Ndour out, Black missed both free throws, but the Bears scored on a put back from guard Anthony Hubbard, tying the game at 62 with 30 seconds left in the game. Prior to Morgan State tying the game, Taylor missed a three-pointer that would have given them a five-point lead. Despite that miss, he wanted a second chance at sealing the ballgame, this time with the game tied. “I told (head coach Jim Christian) ‘I got us. I’m gonna make up for pulling up for the (three pointer),” said Taylor. With time winding down, he let everyone know that he was not messing around. He drove to the basket, rolled in a lay-up and got the foul as well. Taylor would knock down the free throw to put the Bobcats up 65-62 with two seconds remaining. Morgan State would attempt a half court shot, but it would fall short, making the final score 65-62 in favor of Ohio. The Bobcats played well defensively, but were in foul trouble for the second straight game. Jon Smith, Nick Kellogg and Wadly Mompremier each had two fouls in the first half, leading to Smith only playing only five minutes in the first half. They would finish with 25 team fouls, with only Ndour fouling out. Despite following out, Ndour continued his stellar start to his first season with the Bobcats, finishing with a team-high 13 points and a team-high eight rebounds. Also playing well for the Bobcats was junior guard Bean Wells, who had s season-high 11 points off the bench. Coming into the game, the key for the Bobcats was containing Bears guard Justin Black, who was averaging 21 points per game. 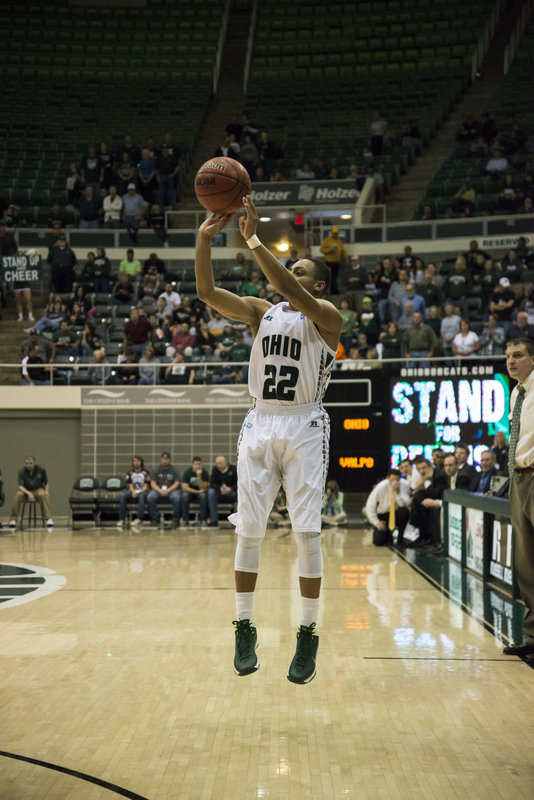 Tonight, Ohio did a fairly decent job of limiting his scoring, as he finished with 17 points. Also playing well was Ian Chiles, who tied Black with 17 points, and also added eight rebounds. Christian saw this not only as a win, but a lesson for his team in the future. “You play games on the road to learn,and their’s a lot of lessons to learn from this game,” said Christian on the Ohio IMG Sports Network Postgame Show. Up next for the Bobcats is Heidleburg, who they will play this Saturday at the Convo. Tip-off is scheduled for 2:00 p.m.
November 21, 2013 in Recaps, Sports.